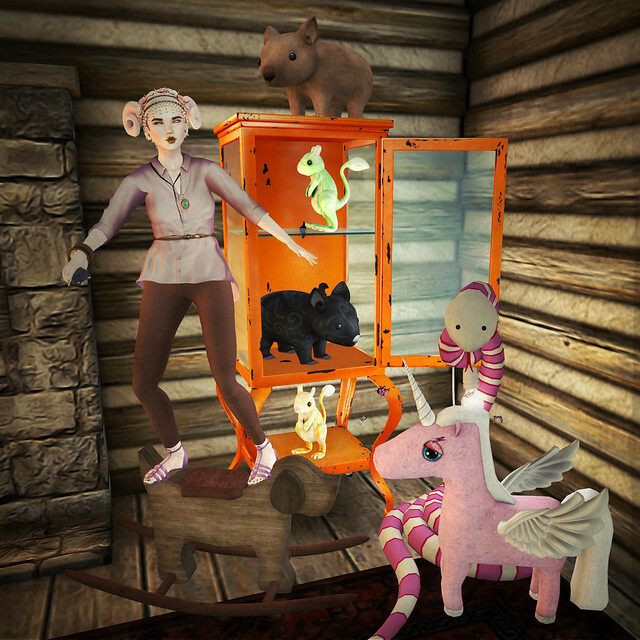 Today I did the rounds of Fifty Linden Friday and found a lot of cuteness. Aikea always, always packs a lot of value into her FLF offerings, and I can't believe that this look (shoes to horns) was only 100L, plus like four outfits in the box that I didn't put on. I also love hyasynth's wooden block toys. Got Squirrel? Tattoo (lower): Vintage tattoo from HUZ. MORE epic fantasy hair! Today's is from Clawtooth, made for Hair Fair (that's over, right?). I love how long and unkempt-looking it is, as though my redheaded and freckled Norse princess had a bad night and hasn't put up her braid yet. I'm wearing it with TLB's corset for Horror Haute, and this tiny skirt from Plastik. Because who doesn't like to see warrior princesses in impractical clothing? My Second Life is still a lot cuddlier with the addition of all these Wild Things. I'm still hanging out with my haul from the Where the Wild Things Are summer gacha event, and I'm thinking about going back for more. Sigh, cute fluffy things are an addiction... It's a nice contrast to my outfit (by ImmateriA) for this month's Horror Haute. Dark and gothy, meet cute and fluffy. I might've gone a little nuts at the Where the Wild Things Are summer gacha event. Can you blame me? Look at all those cute animals, especially the one up there totally photobombing me. It is also bandana day, and I dug this pretty one from Anya Ohmai out of my inventory in honor of it. Shout out to my cancer-suffering brothers and sisters: stay strong and fight!